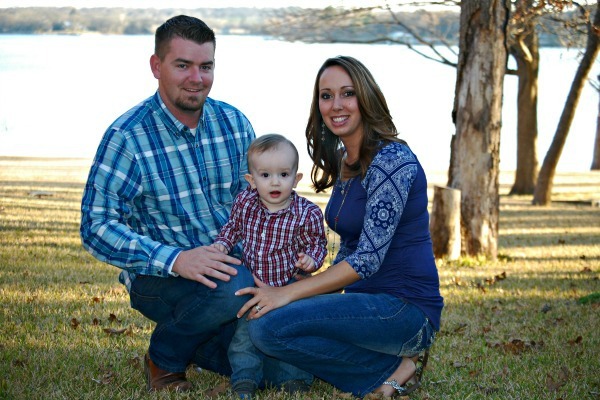 A week overdue for labor and delivery of their first child, Alvaradians Cody and Carly Bearden were taken by surprise when they learned through the sonogram, given as a precaution prior to inducing labor at Cooks Children Hospital Fort Worth, that their baby boy, Jaxon Bearden, had something wrong with his heart. This was not an immediate finding. In fact, the first review of the sonogram invoked reactions that were of low concern. “The medical staff told us that they noticed he had a little problem, but after he was born, they performed an echocardiogram (EKG) and found that he had an aortic coarctation, a critical congenital heart defect” said Carly. “We were hoping for the best, and we were not prepared for that news – it was a complete shock.” Attending cardiothoracic surgeon, Vincent K.H. Tam, MD, and pediatric cardiologist, Matthew Dzurik, MD, suggested that the open heart surgery be performed when Jaxon was five days old because all of his vital signs were very good. When Jaxon was still in the neonatal intensive care unit (NICU), a special care package was given to the Beardens by a family whose son did not survive his heart condition, The giving is a form of legacy that the family of the deceased provides as a gift to all little patients undergoing cardiac procedures within this NICU at Cooks Children Hospital Fort Worth. Mrs. Bearden discussed that Jaxon was only in the hospital for a total of 11 days, six days after his surgery, because the doctors were so impressed with his recovery status. The family was (and is) allowed to carry out their lives as normally as any family of a newborn would without such a complication. There were no concerns and only minimal warnings such as: becoming short of breath, irregular breathing, abnormal eating habits, and disruptions in sleep behaviors because the doctors really did not expect these to occur. No monitors or special equipment were needed. Jaxon went for a checkup two weeks after his release and was seen quarterly for a year. Although his checkups are now yearly, when he reaches age 13-18, the cardiologist will revisit the monitoring as he begins to play sports. To date, no other occurrences have taken place. To see him play as shown in the photos below, getting excited about watching and playing with monster trucks … Gravedigger, specifically, and high-fiving his mother as he shows off his truck is truly a precious miracle! “Sometimes we forget that Jaxon had heart complications. He seems like an average healthy baby,” Carly boastfully exclaimed. “Nothing would have raised a flag without the sonogram that was taken when Jaxon was late – the anatomy scan showed no flags during my pregnancy.” However, she quickly pointed out that this sonogram was part of the wonderful standard of care provided by the physicians. She mentioned learning that every baby is born with a patent ductus arteriosus (ductus arterious [PDA]), a small blood vessel that connects the aorta and the main pulmonary artery. The ductus arterious allows blood to bypass the lungs during pregnancy because the baby gets air from the mother. Carly hopes that by reading this story someone else is helped and another life is saved.